After talking about how to use a ForEach Loop container to iterate through a query result set in the first part of this post; I am going to show how to create a distinct excel file on every iteration dynamically. This functionality will be added over the package I built in the first part. I will basically use an Execute SQL Task with an Excel Connection manger to create a excel file with a different name on every iteration. The connection manger uses an expression in ExcelFilePath to make the file name distinct each time. Ok, no more talking and let’s get to work! 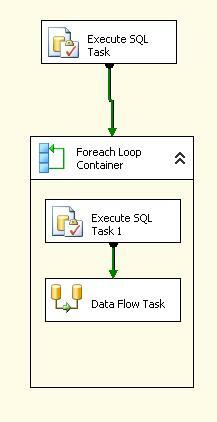 Add an Execute SQL Task inside of the ForEach Loop Container and create a precedence constraint (yes, a green arrow!) 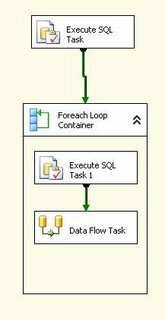 from the Execute SQL Task to the Dataflow task. As you can see, the objective of this EST is to create the excel file to make it available to the data flow task on every iteration; and it is here where the power of the expression come handy. Create a new variable, to hold the file name to be creates. I created a variable called 'ExcelFileName' of String Type (give an intial name in the variable window to avoid validation errors). This was a great article! I used this as a template to build a job that loops through all my servers and get information from the sys tables. Thanks for the blog man! Thanks for this article. I was able to apply this to a similar problem and it works beautifully. You are my hero. This worked beautifully, esp. since I couldn't use the same method I used for dynamically name a flat file. Thank you for taking the time to post this article. It is great that you didn't confuse the primary purpose with a bunch of confusing digressions that would have taken a week to work through. Thanks again for keeping it simple. Rafael.. If i want to export to seperate excel sheet within an excel file in a foreach loop, how do I do it? I was hoping you could help. I've tried to follow your blog the best I could, but when I select the variable in the Excel Destination task, I get a "rowset" error. I've triple checked and the file and location exist. All I want to do, is ensure that the file will be created each time this package is run. Thanks for your examples. I need to combine the 2 different examples. I need and outside loop that creates individual excel files and an inside loop that creates individual sheets within each file. So far, I've got it creating the individual files. Again, thanks and don't go too far, I might be back for more help. I would like to use a foreach loop to loop through a folder with several DBase 5.0 files and create a different table in SQL Server for each DBase file. Right now the loop is working but I cannot create the different tables in SQL Server. Help, please. Your Excel example couldn't help me out. Thanks. I was able to create the loop and multi-sheets. However, I also encounter some problem that are posted before. First, the excel file better to have one empty sheet. Then use the create sql step to create that first sheet for SSIS validation purpose. Third, my header table has Bigint, which SSIS didn't play nice and gives error I32, I64 doesn't matter. I have to cast to varchar type and have an extra variable then cast back before I combine to form the sheetname. Hi Rafael, great blog! Many thanks for the patient details. In addition to dynamic sheets, I need to retain colored formatting for a static # of rows & columns. (Tried using a template but got hit by the appending issue). Could you please suggest a possible solution for this? Many thanks for your article, it is absolutely accurate and efficient. Your posts on Header-Line exports to Excel are increadibly helpfull! I have never tried SSIS creation before and I am up and running in no time with input from your blog. I do have a few questions though, things that bug me a bit... maybe you have some clue about them. Firstly, is it possible to only have one template excel file? I can only get this running if I first create all the files I expect to generate. Secondly - how would I create new files instead of overwriting my templates? 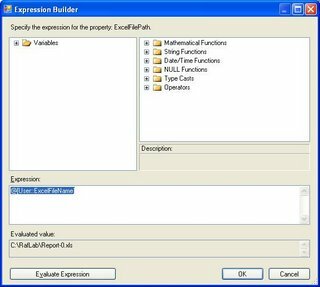 Thirdly - I had problems with auto formatting and found this post about how to handle it: http://www.justintubbs.com/code-samples/ssis-excel-source-failed-to-retrieve-long-data.php. I now have a sample line in all excel templates indicating that most of my columns contain text with more than 255 characters. Is this really the intended way to handle things? It feels like a bad and error prone work-around. My Excel files will be distributed for completion of data and then imported again and I dont like sending out junk data like this, and even worse - relying on random users not to change this junk data so that import will run smoothly. Lastly: will I need to supply my excel templates as part of the ssis install package when delivering this to the production server? Thanks a million times for your great posts! Hi, A really useful blog. Can you show us how to perform the below task. Export MULTIPLE sql server tables data in to same excel file but different tabs. It is a good post. But i have a column of a big size and i am creating the sheet having a column size of nvarchar(4000) but it gives error in that..
Is it not possible to create a large column size in excel file dynamically?? check that the object exists in the database. 'Excel Destination' and tried to create a new one again, but get the same error. How to recreate 'Excel Destination'? How to recreate 'Excel Destination' without getting error? `HeaderID` INTE..." failed with the following error: "No disconnected record set is available for the specified SQL statement.". Possible failure reasons: Problems with the query, "ResultSet" property not set correctly, parameters not set correctly, or connection not established correctly." This is a fantastic post! Everything was working in my package except I was missing the create table step. This new process that I created will save headaches. Bravo! Thanks for posting the article. This was perfect for quick dump of data for our analysts today. Great Article. Easy to understand! Regards. Leonard S.
The Excel files are created in the second Execute SQL Task inside of the ForEach loop container. There is no out of the box functionality that allows for that kind of dynamic mapping in a dataflow task. You would need to create your package programmatically or re-design the process in such way that the number,name and data type of the columns is always the same. Thanks for the nice and useful post.My requirement is to create an excel file on each iteration and send that file as an outlook attachment in email to every user. Can you help me? If you can provide me your email id, i can send you the detail scenarion. Thanks for spending time on investigating. I will look into the link provided by you and let you know if i get any solution. Thanks, Have a great day..
Hi Rafael, Thanks for this very useful post. I followed your example and every thing works fine except that I need to create a sheet that has spaces in the name like 'Data Sheet 1'. It created 'Data_Sheet_1' in the destination Excel file. I tried the following different ways (put single quotes or [ ] or $ or combined), none of them worked. The Excel file exported from my SSIS package will be used as input file for another application which is looking for that specific sheet name. Can you help me on this? Thanks. OMG, THANK YOU for posting this! My package kept erroring out on me over and over again and no matter what I tried and how many other blogs I read, your post is the only one that worked!! Thank you for saving my sanity!! I have a slightly different approach which is failing. Can you help me please? Inside a for each loop, I have a file system task which has XL templates as source and destinations. Then I have a variable where the file name is getting changed to second and minutes and so on. the package is failing saying that Open Rowset failed. In the advanced editor for the excel destination the open rowset is blank. I want to dump 4 different views or tables from the sql database to 4 different sheets in a single excel file using script task. Can you help me? [Excel Destination ] Error: SSIS Error Code DTS_E_OLEDBERROR. An OLE DB error has occurred. Error code: 0x80040E37. [Excel Destination ] Error: Opening a rowset for "EmployeeCode-999" failed. Check that the object exists in the database. I just want to add that in my case I had to set the DelayValidation to True for the Data Flow Task container, otherwise I would get an error telling me that the table (for the Excel file) wasn't available. Hope this helps and thanks again ! At this point in your instructions 'Open the Execute SQL task and change the ConnectionType to ‘Excel’, Choose the Excel Connection Manager". Is the 'Excel Connection Manager' the same one we previously created in step 1, or a new one? Thank you for this post. I had a question, Can we have a pre-formatted header row, with background colors, fonts, etc. Hi Rafael, Thanks for the artical it really helped me with and issue I'm having. We've encoutered another and was wondering if you had some advice. I've used the execute SQL task like you said to create and excel file but where mine differed is that instead of using SQL code I passed a Variable which has the code to create the table in excel this variable changes every loop thus creating multiple excel documents and the columns and the data types are different on each loop. The issue i'm having is that when I try write from my source to the excel destination i get a "Cannot convert between unicode and non-unicode string data types". Normally You'd use a transformation task but as the columns vary on each loop how can i achieve this? Nice article. This helped me solve my issue of creating dynamic excel destinations.